Lemon, eggs, and watermelon all done on Sunday leaves chicken jars, greens, and meat for Tuesday. Tuesday morning I wake up, drink my green tea and lemon, do my 750 words, tidy the bedroom, and tidy the kitchen. I'm having fried eggs and avocado vegetable hash for home breakfasts, so it's a good use to time to put the dishes in the sink to soak, mostly to clear off my tiny workspace, which is the top of the kitchen cart that I refinished when I was baked on vicodin, cut up the vegetables for my hash and get them in the oven, and let them roast while I wash the dishes. Then I finish up making the hash and a couple fried eggs, and eat my breakfast in the living room. After breakfast, I go back to the kitchen. 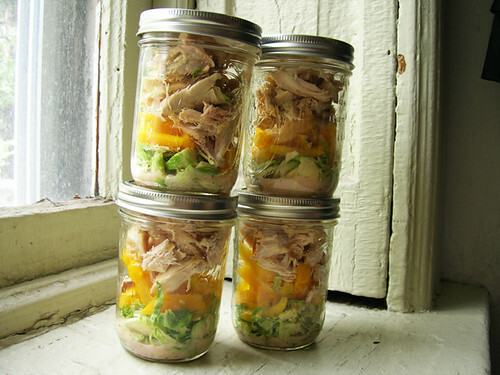 The cutting board is still out from making breakfast, I cut up my vegetable and my pepper for my chicken jars, whirr up some vinaigrette in the rocket blender and pour it over the vegetables in the jars, and then divide up the chicken into the jars. This is chicken with thinly sliced brussels sprouts and yellow bell pepper, with my go-to red wine vinegar and olive oil vinaigrette. Drumsticks and wings get saved for other lunches, I usually eat those with a cut up nectarine. I used to save the carcass in the freezer to make stock, but it was getting to be like the sorcerer's apprentice in there, except with frozen chicken carcasses and frozen stock instead of mops and buckets. I honestly don't eat soup that much, it's not enough food. I only eat soup when I'm sick. So regretfully, I've been throwing out the carcasses. Then I put a pot of water on to blanch the greens, I say greens instead of kale because Glory also makes bags of collard and turnip greens, so I've been mixing them up. 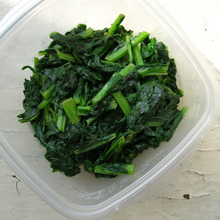 I blanch the greens and saute them, and then they go into a takealong container. I don't know why not a mason jar, but this container works. 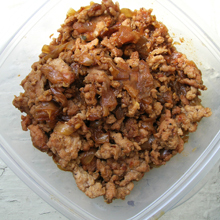 Then in the same pan that I sauteed the greens in, I make either Korean ground beef or Chinese ground pork. Did you know, turmeric grows in roots like ginger? If I could get fresh turmeric at the Jewel, and also ground mutton, which did you know you can get that at the supermarket in London, I could make a something or other ground mutton. Indian or Persian. But Jewel does not have fresh turmeric or mutton or even ground lamb, oh well. Also Food In My Beard has an an intriguing recipe for sloppy tofu, which I could could turn into something or other ground tofu. That I can do. I wonder why I didn't think to cook up a pot of quinoa and toss it into a container for quinoa bowls, instead of rice bowls with the Trader Joe's rice. I think I'm going to eat up my stock of rice and then try that, doesn't that sound good? Quinoa with kale and meat? Then when it gets cold enough, I'm going to go back to baking sweet potatoes and keeping a container of sweet potatoes in the fridge for sweet potato bowls. Anyway. This here fridge. Is stocked with a jar of cut lemons, green tea in the pantry, a half carton of six hardboiled eggs, three jars of cut watermelon, more eggs, zucchini, jalapenos, and avocados for hash, four chicken jars, a container of shaved parmesan, raisins and walnuts in the pantry, also cashews in the pantry, nectarines, a container of kale, a container of meat, microwaveable rice in the freezer, a container of greek yogurt, a jar of applesauce, a jar of natural peanut butter that I'm trying out that has to be kept in the fridge, frozen apple juice cubes in the freezer, almond milk, and also club soda, coconut water, and tart cherry juice for workout drinks and sometimes I like tart cherry soda. I have all these things written out on a list, of course I do.